A catchy premise keeps this movie going strong for a while, but it does start to run out of steam and become repetitive in its second half. This movie is pretty good for most of the way through. it certainly has a great initial idea about a married man whose wife and son go away for the summer, leaving him alone at home to get into trouble. The movie does something else pretty cool too, which is that it explains that this is more than just the story of one man. This is something that has been going on with men for ages, since the time of the native americans, and is a pattern that our main character, Sherman, sees all around him today. men lusting after beautiful women as soon as their wives have gone away. The beautiful woman here is his new neighbor, played by Marilyn Monroe. The movie focusses on two nights with her living in the apartment above Sherman. the problem is that the second night is way too similar to the first one. that means the second half of the movie ends up feeling like a retread on what we’ve already seen. There’s a lot to like about this movie, but unfortunately it does start to get too repetitive in its second half. The Seven Year Itch is a pretty fun and enjoyable movie. There’s only one problem. It’s repetitive. There’s a great premise here and it’s carried out nicely for a while, but after about halfway through the movie, there seems to be nothing new to offer. Instead, the storyline retreads on some of the same sort of things that already happened. It doesn’t pick up again until the very end, and that means there is nearly a whole second-half which feels exactly like the first half. The movie is about a guy named Richard Sherman. It’s the summertime and every summer the men who work in the city send their wives and children off to the countryside where they stay at resorts on the lake and get away from regular life. I love the way this movie shows us that situation in a comedic way, using Native Americans to present this idea of sending the wives off as something that has gone on for centuries. As the wives are leaving in canoes and the men are waving goodbye, their heads start turning to the new and attractive women who are walking by. This is meant to be a funny version of what is to come. Sherman sends his wife, Helen, and son, Ricky, off to the countryside. He goes to the airport to see them off and forgets to give them a kayak paddle, which he ends up having to drag all over town. Sherman sees men at the airport who have said their goodbyes to their wives and are already lusting after the newest, hottest women. He insists that it won’t be the route he goes down, and that he won’t cheat and he won’t smoke. Sherman does a lot of talking to himself here. He continues it when he gets home, after stopping off at a restaurant for a quick bite first. A movie today would have used an inner voice-over narration for this, but in the Seven Year Itch, it’s the character speaking out loud to himself, explaining everything he is thinking. The strategy actually works pretty well for this film and adds a lot of humor. Sherman has a hard time resisting going out and trying to prove he can still get girls. He sits outside on his patio and daydreams about his wife calling. He knows that Helen will be calling at 10:00 and he starts to wonder about why. Sherman thinks its because helen doesn’t trust him. then he gets it into his head that helen actually thinks he is too old to pick up girls anymore. At this point, we start seeing the images of what sherman is thinking about. we see helen appear beside him and laugh at his ideas about getting women. we start to see sherman make up stories about women who have come onto him and been unable to resist. most of these are pretty funny. they involve him being at the hospital, at his job, and even with helen’s friend. sherman makes up the stories and then helen tells us what really happened. All of that changes when sherman meets his new neighbor. this is the girl, played by maryln monroe. the first time he meets her, it’s because she buzzed his bell to be let inside the building. he can’t take his eyes off her as she makes her way up the stairs to the apartment above him, where she is staying for the summer. then, while he is outside daydreaming, she accidentally drops a plant that lands next to him. sherman is very forgiving once he sees who it is that dropped it. he even invites the girl down for a drink. This first night with him and the girl in his apartment is a lot of fun. sherman tries pretty hard to resist the girl’s temptations, and even tells her that he is married and so she has nothing to be afraid of. even still, when the two of them sit beside each other on a piano bench and play a rendition of chopsticks together, Sherman can’t hold it back any longer. he pounces on the girl and has to appologize profusely as soon as he comes to his sense and realizes what happened. The next day, sherman goes into work and when he comes home for the evening, it’s more of the same. this is where the movie loses all of its steam. sherman doesn’t even try to put up the same level of a fight as the night before, and instead, he and the girl get more and more close. there’s nothing new going on here that didn’t already happen the night before, and that’s the biggest problem with all of it. when the man who is in the countryside with sherman’s wife comes by to pick up the paddle, the movie suddenly gets interesting again, but it took a while to get back on track. 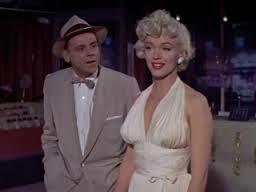 The Seven Year Itch is a pretty good movie with a very funny premise. I love the way the film is so simple, taking place almost entirely inside of sherman’s apartment building. I also like that it is basically just the story of two nights. the problem is that there is very little new material saved for the second night. a good story needs to grow and introduce new angles and twists that move the storyline along. this film doesn’t really have it. it’s definitely cute and funny, but the story needed to go a little further.